Dollops of Diane: Our Roller Skating Adventure! This morning, the kids and I headed out for some roller skating fun. 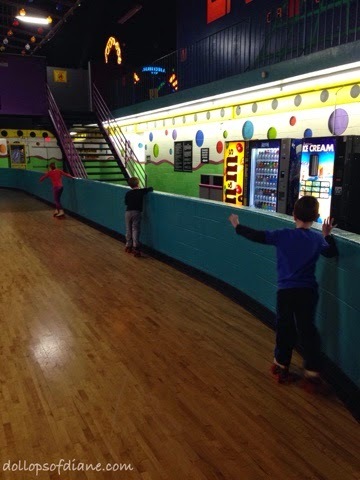 In hindsight, going alone with three kids who have never roller skated before was a bit ambitious on my part. 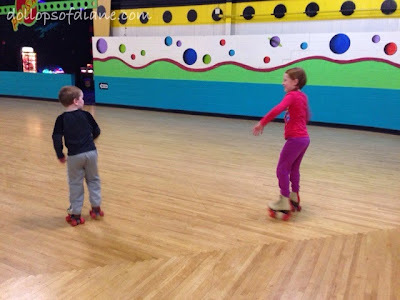 Getting the kids in skates alone was like a 20 minute process! However, at the end of the day, we are all alive and not too much worse for wear! We decided to try out United Skates of America in Rhode Island which is less than a half hour from our house. They had coupons on their website for vacation week so for skating and rentals it ended up being $10/kid. I didn't skate so I was free. I thought that I might have to skate since I knew I'd have to go on the rink with them but I was allowed to just wear my regular shoes which was definitely a sanity saver for this trip. It was HARD when we first got out on the rink. Pretty much none of the kids could stand even while holding on to the sides. You forget how difficult roller skating is! Dominating the wall like bosses! Isabelle was first to break free from the wall which surprised me since she can be a scaredy cat. However, she's also the oldest so I think the coordination came a bit more easily for her. Daniel was second to break free and really it was only his complete lack of fear and wanting to go a million miles an hour that made it hard for him. Then there was Henry - oh, Henry. That kid never made it off the wall! So really the challenging part for me was having all three of them at different levels and trying to keep an eye on all of them. It is a circular rink but there is a concession stand/seating area in the middle that blocks a full view. I eventually just had to tell myself that I'd hear the other ones screaming if they fell and really hurt themselves! While we were taking a water break at one point, they announced that they had hidden some small dinosaurs throughout the rink and by chance I happened to have spotted one while grabbing napkins. So Henry turned it in and got a free game of laser tag in exchange. That actually worked out well so he could do that while the other kids kept skating. In the end, the lazer tag was his favorite part of the day. Oh, and the free cotton candy they were giving out! 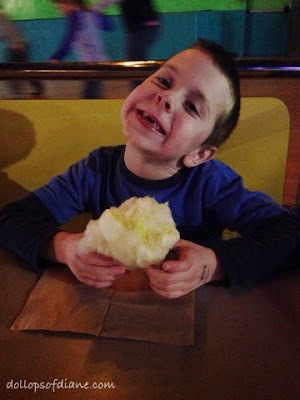 Cotton candy is more fun than skating! So all in all, it was a lot of fun. 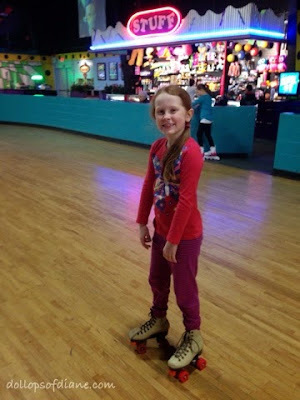 I got to reminisce about my good old days at Skate Town and the kids got to try something new. United Skates actually has a lot of different things there including skating, laser tag, video games (although they seemed pricey from what I saw), rock climbing, and more. Not a bad spot to check out if you haven't been there before!